When I was a child my favorite breakfast was “Circus Eggs”. I have no idea where we came up with that name for Egg in the Basket but I still am rather fond of it. I loved dipping the buttery fried toast into the soft yolk. 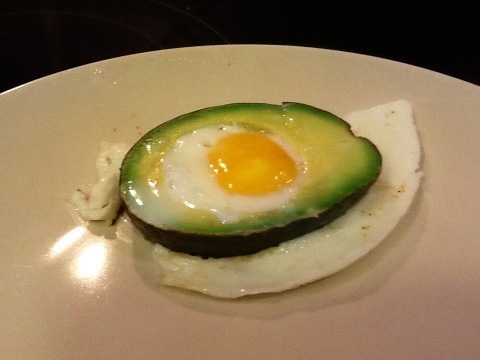 Eggs in Avocado Slices is a sophisticated adult take on the recipe, which is why I knew Jewel would like it. Preheat a pan over medium-low heat with a little olive or coconut oil in it. 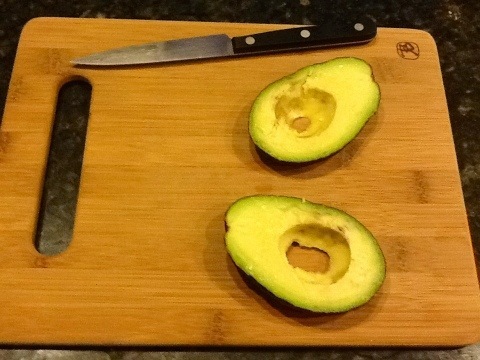 Lop both sides of the avocado off like this. Leave as much intact as you can. I don’t know how to describe what I mean so just look at the picture. 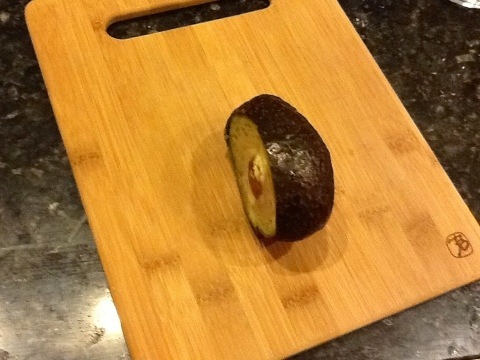 Now slice what’s left of the avocado in half so it looks like this picture. Enlarge the holes where the pits were. I used a medicine cup, but a shot glass might work as well. Save the leftover avocado pieces to put on your salad at lunch or go all-out and make some homemade guacamole! 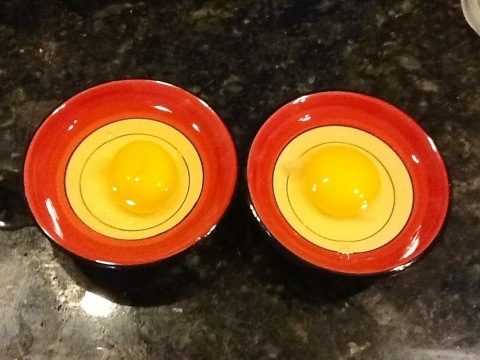 I’m pretty spastic when it comes to cracking eggs, so I cracked them into little bowls first. This step is optional but recommended for the coordination-impaired. 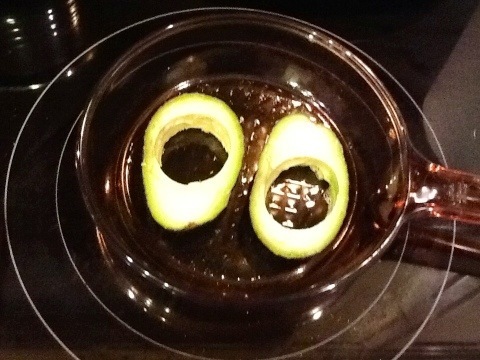 Place avocado slices in pan. 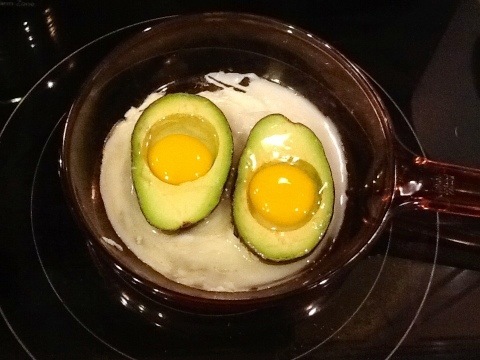 Gently pour the eggs into the holes in the avocado slices. As you can see, my eggs were too large. Medium eggs would be about the right size. If you’re lucky enough to find pasture-raised eggs, choose a couple of the smaller ones for this recipe. Cover the frying pan with a lid so that the yolks will cook before the bottom gets burned. This only takes a few minutes. This is what mine looked like when they were done. Yeah, I’m not ready to host a cooking show quite yet. Jewel and I thought these were delicious. 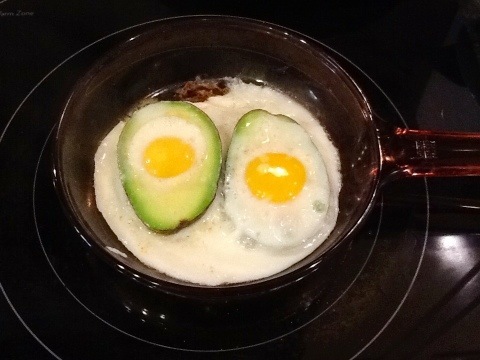 I’m not sure I’ve ever had cooked avocado before, but cooking it brought out the creaminess of the avocado, and eggs and avocado are a natural match. I served this with thick-sliced bacon, so I was able to dip the bacon in the yolk. Yum! I forget who we got the circus egg idea from, but, know we were making them when you were quite young. You devouring the yolk and Beth the whites. The avocado version looks fantastic, with all of them in AZ, I should give them a try. I’d still like to have a dipping piece of toast. Did you add a tsp. 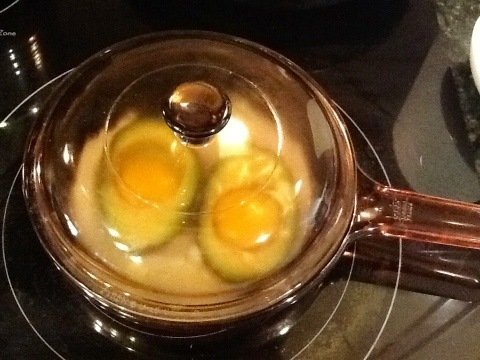 or so of water to the pan before covering to steam the egg quickly? 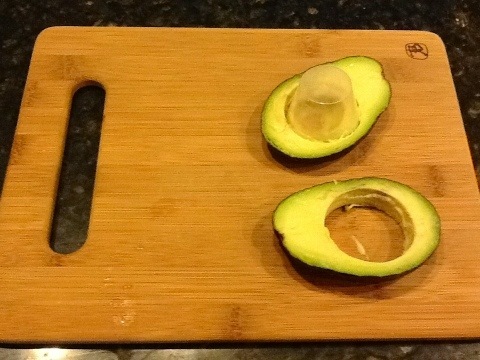 or did the avocado keep the moisture level up? Dad would love a couple splashes of hot sauce on top. I didn’t add add water and it didn’t seem to need it. They would taste great with a dash of hot sauce or even salsa. 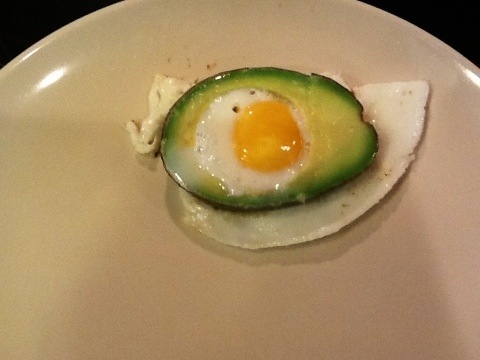 So happy you liked the avocado eggs! Don’t you love food that is fun? Very much so! Thanks for sharing that recipe! I also want to try the flower eggs. I think it’s important for food to be visually appealing as well as tasty.